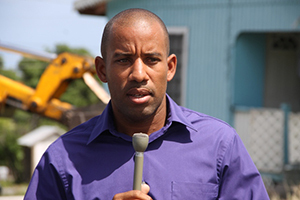 NIA CHARLESTOWN NEVIS (October 31, 2014) — Manager of the Nevis Water Department (NWD) Roger Hanley, is appealing to vehicle operators, in particular, heavy trucks drivers, to reduce speed when driving through the Department’s active construction zone along the Island Main Road. The appeal came on October 31, 2014, after it was observed, that a number of those vehicle drivers had not heeded previous warnings from the Department and continued to drive at high speeds, in areas where workmen were engaged in pipe installation for the Nevis Water Supply Enhancement Project. According to Hanley, the cooperation of all would be appreciated.